Although I started off this theme of blog postings with Steve Gullick, that was largely as a result of his new exhibition in London and the associated interviews and write-ups that he was getting. Although he is one of my favourite music photographers, the true number one spot should go to a photographer who I only became aware of in the last few years, Herman Leonard. As with myself, most music photographers seem to be completely unaware of Herman Leonard, even though they might have seen his work in print. I think that this is largely due to having moved in slightly different circles by photographing jazz musicians, meaning that he flies under the radar of most â€˜rockâ€™ music photographers. In addition, I think the fact that he started photographing in the 1940s means his work largely pre-dates the music photography of the 1960s of classic rock bands that photographers associate with as the starting point of music photography. He used a large-format camera with sheet film, a world away from the digital technology that most photographers now use, and by using a large-format camera, the level of detail in his photos is amazing. He did have one advantage over most modern day photographers in that a lot of his photographs were taken at rehearsals/sound checks, allowing him to bring and set up his own lights and not rely on the venues own lights, or more likely the lack of light. But that should in no way take away from his work, which is truly exquisite and completely awe inspiring. What Iâ€™ve tried to take from him is his portrait style of photographing and also the beauty of monochrome; I still convert probably the vast majority of photos to black and white or convert and tone them even when they look good in colour, and even photos taken in daylight. Thereâ€™s just something about black and white that can take a good colour photos and amplify the results substantially by converting it to a monochrome image. 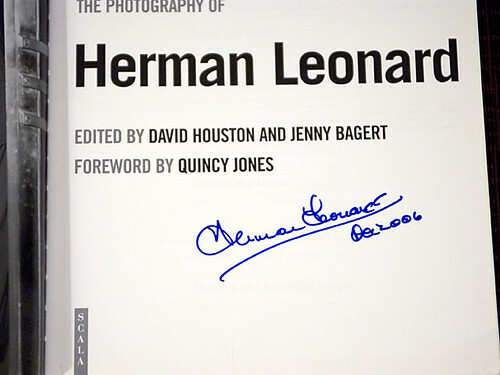 By chance I was re-checking out his website late in 2006 and saw that he was doing at book signing of his new book â€˜Jazz, Giants and Journeys: The Photography of Herman Leonardâ€™ at Book Soup in LA and that you could order a copy over the internet. So have a nice signed copy on my shelf, as seen in the photo at the top of the page. However, I also picked up a copy of one of his previous books, â€˜Eye of Jazzâ€™, on eBay cheaply and if you can get hold of it, I really recommend you do so, as itâ€™s fantastic and soley devoted to his music photography, whereas â€˜Jazz, Giants and Journeysâ€™ is a mix of his music, travel and portrait photography. Thereâ€™s a really good 30 minute interview Herman did at San Diegoâ€™s KPBS radio on their website, here. This entry was posted on Friday, May 9th, 2008 at 12:01 am. It is filed under Music Photography and tagged with Book Soup, Eye of Jazz, Herman Leonard, Jazz, Jazz Giants and Journeys, Justin Edwards, KPBS, Masters of Music Photography, photography, podcast. You can follow any responses to this entry through the RSS 2.0 feed.